As you all know, calendars everywhere marked March 20 as the first day of Spring. Unfortunately for us in the Kansas City area, no one told the weatherman here. As a result, we ended up with at least 6 inches of snow here in Lawrence. 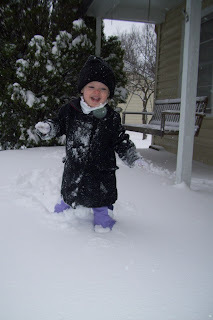 Avery didn't seem to mind though, this was really the first time we have let her romp and play in the snow. She loved it! 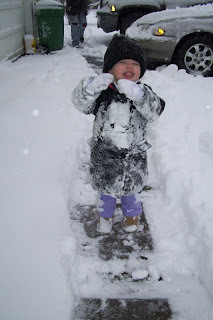 She especially loved having "mittens" on her hands. Here are a few photos and videos of the occasion. 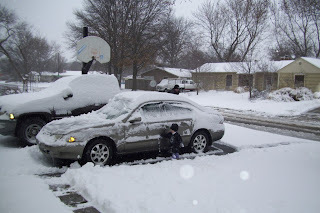 "Hello from a Lawrence, KS Spring day"
Helping Daddy scrape snow off the cars. As we have come to expect in Kansas, 2 days after the snow it was 70 degrees and now it is back to overcast and 40's. Needless to say, we don't change out our closets with seasonal clothes very often, they pretty much all stay out all year! 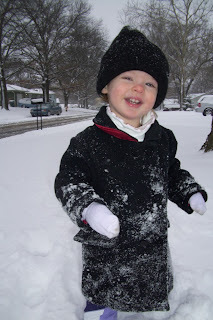 Oh how beautiful Avery is in the snow and her coat and hat! 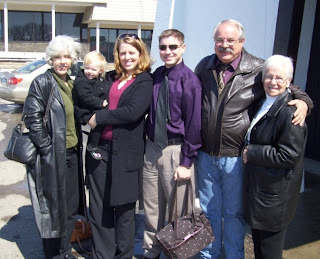 Don't want to cause an avalanche of lookers but I see baby 2 under that coat of yours....Yay!